Few institutions in the nation’s capital are older than WGL Holdings. Its history dates back to 1848, the same year the Washington Monument’s construction began and 15 years before the U.S. Capitol’s iconic dome was completed. In fact, one of the company’s first projects (when it was known as Washington Gas) was to build a power plant that could reliably source and deliver gas necessary to light the Capitol’s dome. 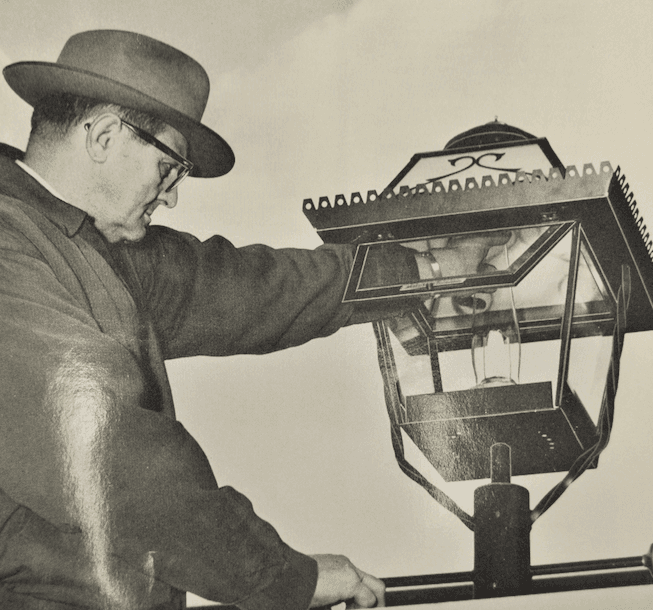 In addition, one of the chartered company’s most important missions was to ensure D.C.’s streets were safely lit at night. A decade after its founding, the company boasted 30 miles of gas mains, 500 street lights and 1,700 customers. No one talked about “sustainability” or “energy efficiency” during the mid-nineteenth century, though Washington Gas had already become adept at procuring natural gas and coal at a competitive price – necessary to accommodate the rapidly-growing city and crucial when the country lurched into the Civil War. Over a century and a half later, the company’s Capitol Power Plant has increased its reliance even more on natural gas as its primary fuel source. The cogeneration plant produces steam and electricity together, allowing for a reduction in the emissions of greenhouse gases and harmful air pollutants. By supplying both power and heat for the Capitol’s buildings and grounds, this system increases reliability, improves efficiency and saves taxpayers money. Today, the business jargon, economic climate and consumer needs all have shifted, but WGL’s commitment to keeping D.C. heated and electrified has never wavered – and now it is focused on doing so sustainably and responsibly, as demonstrated by that power plant still operating in southeast D.C.
“That evolution mirrors our own; innovating and finding energy answers for the last 169 years,” said John Friedman, sustainability manager for WGL Holdings. Those answers involve delivering both cost-effective and secure power and heat to customers across the greater D.C. region. A focus on finding solutions for its customers’ energy needs has helped WGL build upon its success as it generates approximately $2.5 billion in revenues annually. But in recent years, the company has confronted newer challenges, such as delivering energy while it both mitigates and adapts to climate change risks. Not that the company’s overall mission has changed much. “Interestingly enough, when the Sustainable Development Goals (SDGs) were agreed upon in Paris, one of them was ‘ensure access to affordable, reliable, sustainable and modern energy for all,” said Friedman. Several challenges, of course, confront WGL as it seeks to curb emissions while meeting the needs of a growing population. In the short term, the company has to look at how it can accomplish its goals with expensive infrastructure already in place. The company has plenty of data at hand – as in the fact that replacing coal in existing power plants across the U.S. has cut emissions nearly 9 percent from peak levels of 6 billion metric tons in 2007. For each unit of energy produced, a megawatt-hour (MWh) of natural gas-fired generation contributes about half the amount of emissions as coal-fired generation, according to the Energy Information Administration. But phasing out coal in favor of natural gas is only the beginning. The company also has set long-term goals, such as more interest in the development of clean energy technologies. Renewables accounted for 14.94 percent of U.S. electricity in 2016. Most energy experts agree they will become the second largest source of power behind natural gas by 2028. “We see natural gas, which is abundant and affordable can come on line when things like solar and wind are not producing power, as a natural partner in providing affordable, reliable, sustainable and modern energy,” said Friedman. There are additional hurdles WGL must tackle in the coming decade, such as the company’s pilot program to explore the potential of biogas. Much of it currently leaks into the atmosphere – but these gases, such as methane, could be stored and supply energy for WGL’s customers. In addition, energy storage stands in the way of renewables from scaling up even faster. “How can we capture that power and store it for when it may be needed?” asked Friedman. Another challenge is the loss of energy while it is transmitted to homes and businesses. Natural gas retains 92 percent of its energy when distributed from its original source to homes; electricity, however, only has a retention rate of only 32 percent as it is transmitted to buildings. So even if the sources of energy evolve, WGL and its competitors are reliant on technological advances if they can continue to provide affordable energy with minimal impact on the environment. For WGL, the SDGs are a way to harness the vital role energy can affect other goals, including health, quality of life, economic opportunity and of course, mitigating climate change. The riddle the company must solve is ensuring that energy access is still affordable while it becomes more responsible. Therefore, if renewables will be further integrated into D.C.’s grid, reliability will be essential. Challenges including offering reliable affordable service, in order for energy to be readily available when and where WGL’s customers need it. To that end, Friedman pointed out that system reliability is one of the key metrics on the company’s scorecard. In 2016, the company had a 99.7 percent target of customers who experienced no unplanned service interruptions; by year-end the company exceed that goal with an impressive 99.85 rate. Now the company is in the middle of one of the largest upgrades it has ever undertaken, with an added benefit that these new materials and equipment will also decrease emissions. Based in Fresno, California, Leon Kaye is a business writer and strategic communications specialist. He has also been featured in The Guardian, Sustainable Brands and CleanTechnica. When he has time, he shares his thoughts on his own site, GreenGoPost.com. Contact him at leon@greengopost.com. You can also reach out via Twitter (@LeonKaye) and Instagram (GreenGoPost).